If you have no air conditioner you will be much cooler. Universal Tile Ventilator systems are the best systems in the world for roof space ventilation and ducting through the roof. Roof vents are a very important element of roofing, effective roof ventilation can extend the life of the roofing material in the roof. To properly ventilate a roof cavity you need intake vents to allow fresh air into the roof space and exhaust vents to allow air to leave the roof space. 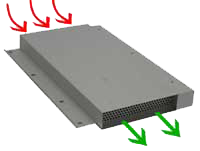 The amalgamation of an intake vent in connection with an exhaust vent allows for a very effective roof ventilation system. 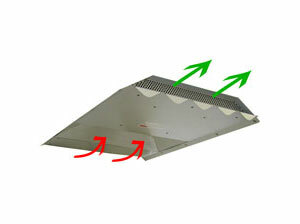 The purpose is to balance the temperatures inside and outside the roof space 24/7. These are roof ventilation systems that really work for the roof space and the ducting of rooms via flexible ducting connected to our unique duct systems and evacuating through our unique ventilator systems. ·Temperature problems ·Heat is unbearable ·Summer and winter condensation problems ·Are you losing real money on energy costs – excessive cooling bills – excessive heating bills ·Sick building syndrome. 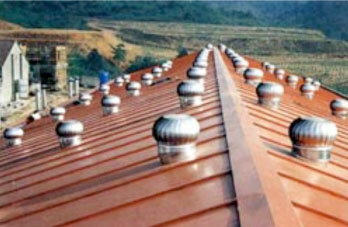 You need roof ventilators for roof space ventilation. What happens without roof ventilation. SUMMER HEAT, UNBEARABLE TEMPERATURE PROBLEMS - The temperature in roof spaces can reach in excess of 60°C. This heat radiates downwards causing discomfort in the living areas and many sleepless nights and massive cooling bills. We have all felt this, you need effective ventilator systems. CONDENSATION PROBLEMS – During winter and colder months normal household activities can wreak havoc in a roof space and ultimately a roof. Showers, laundry, dishwashing and cooking all generate moisture that can condense to form 12 litres of moisture a day this can cause damage to your roof timbers, dry rot, ceiling damage, moisture soaked insulation becomes ineffective, a breeding ground for termites, mould, mildew, fungus, bacteria, dust mite etc all these problems can lead to Sick Building Syndrome. All these problems can be going on only to be detected when it is a huge costly problem. Go to Case Studies & Reports read the facts. THEY WILL KEEP YOU COOLER IN SUMMER AND WARMER IN WINTER. Also featured on Better Homes and Gardens TV program as Energy Saving Products with Constant Yearly Savings on Energy Bills. You will discover with our roof vent for tile roofs, the Smoothline metal vent for metal corrugated colorbond roofs are proven to save you real money on energy costs – guaranteed you will love how easy they are to install. Better for your health, giving you real effective results. The two fundamental benefits of an effective roof ventilation system are – a cooler house in summer and a dryer roof space in winter. Natural ventilation is the best way to achieve this, however with so many ventilators on the market promising to achieve results today both natural and motorised, most just literally do not work. These are the best most economic roof ventilators available on the market today and will last as long as your roof or longer. 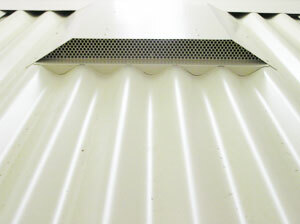 The Smoothline® Roof Vent for corrugated colorbond roofs. Condensation is a major roof problem and roof ventilation can just be the best remedy. The other problems that this can remedy are mould and mildew problems that can cause Sick Building Syndrome. There are many types of roof cavity vents available today whirly birds, gable, power, static, cupola, louver, dormer and ridge vents. All of these depend on other means for intake air for the roof, mostly eaves vents however sometimes even ceiling vents most of them simply do not work with or without the other means for induced air, they simply do not work especially ridge and whirlybirds. 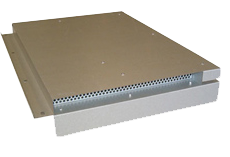 The Universal Tile Ventilator System and the Smoothline Systems are the only systems that have an inlet vent and an outlet vent within the roof covering that work effectively in unison within their own system. Year in year out for a one off cost you cannot beat these systems, how could you chose any other ventilator. We also have the duct connections for ducting interior spaces through the ventilator for connecting a bathroom, kitchen or any room in the home with a tile vent and duct or with the Smoothline through the roof, we have a single or a double duct that can exhaust through a single Smoothline. "Would I like my roof to look like this? Nah, I don’t think so."